If you want to be healthy and look beautiful, you have to start from the inside. One of the healthiest diets to follow is the Mediterranean diet. It's made up of the very freshest, healthiest foods available and lowers your risk for heart disease, cancer and many other diseases. It's one of the most followed diets in the world and many celebrities follow this diet to help maintain their youthful, radiant looks. The staples of the Mediterranean diet include fresh fruits and vegetables, whole grains, nuts and seeds, legumes, seafood, yogurt, olive oil, and small amounts of wine. You should look for organic foods in season and grown locally, and Mediterrean dieters avoid processed food. 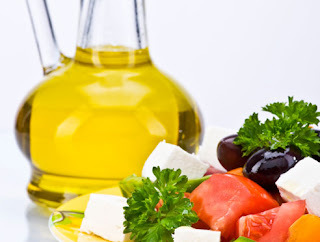 The Mediterranean diet focuses on small portions of high-quality food. When food tastes delicious, a little is enough because your senses have been satisfied. Healthy fats like olive oil and nuts, which are staples of the Mediterranean diet, keep you feeling fuller longer than diets that restrict fat or forbid it altogether. Here are the basics of the diet. The Mediterranean people use olive oil in almost everything they eat, including pastas, breads, vegetables, salads, fish, and even cakes and pastries. It's the principal fat in the Mediterranean diet, replacing other fats and oils, including butter and margarine. What's so healthy about olive oil? Researchers have found that oleocanthal, a compound in olive oil, may reduce inflammation, which could help prevent conditions like heart disease, diabetes, arthritis, Alzheimer's, and autoimmune diseases, as well as cancers. Found in abundance in the Mediterranean diet, omega-3 fatty acids are bursting with health benefits, according to Stutman. Fatty acids have been shown to reduce the incidence of heart attacks, blood clots, hypertension, and strokes; and may prevent certain forms of cancer and lower the risk of neurological disorders like Alzheimer's disease. "A diet higher in plant foods and lower in animal products has been linked to decreased incidence of heart disease, diabetes, and many cancers," Adamson says. The traditional Mediterranean diet is practically vegetarian, with lots of fish and very little meat. As for vegetables, Mediterranean people feast on tomatoes, broccoli, peppers, capers, spinach, eggplant, mushrooms, white beans, lentils, and chick peas, according to Stutman. Many Mediterranean people drink a glass or two of wine each night with dinner. But portions are small, generally about three ounces (a third of a small wine glass or two shot glasses). When taken in small amounts, wine has been linked to lower rates of heart disease, likely due to the presence of antioxidants like transresveratrol and oligomeric proanthocyanidin (OPC), which keep blood circulation healthy and prevent blood clots from forming. Whole grain foods like bread, pasta, potatoes, polenta, rice, and couscous are a key part of the Mediterranean diet, according to Stutman. In their natural state, grains are full of cancer and heart disease-fighting fiber, vitamins, minerals, and nutrients. But stripping the grain's outer layers to make white flour and white rice eliminates these benefits, reducing the healthy whole grain to little more than empty calories. Whole grains provide energy and calories with little fat, and because they're slow to digest (thanks to their high-fiber content), they help you feel fuller longer. For Mediterranean people, fresh fruit is the typical daily dessert. Taking advantage of fruit's natural sweetness has double benefits. First, what you gain: the fiber and nutrients in fruits like apples, grapes, and oranges. What you lose: the added sugar, calories, chemicals, and unhealthy fats in sweet, processed desserts. Research supports the health boosting qualities of the Mediterranean diet. In a 12-year study of close to 2,500 people, researchers found those who followed the Mediterranean diet had a significant decrease in body weight, blood pressure, blood fats, and blood sugar and insulin levels - health benefits that contribute to a longer life expectancy than that of people who follow a Western diet, according to Fred Stutman. Eating the Mediterranean way may also protect the brain. In a 4-year study, researchers from Columbia University Medical Center found that subjects who followed the diet had up to 40% less risk of developing Alzheimer's disease than those who followed a typical Western way of eating.